RIDGEFIELD PARK, N.J. – May 1, 2014 – Samsung, a market leader and award-winning innovator in consumer electronics, announced today a new retail initiative at select Best Buy stores. As the world’s largest multi-channel consumer electronics retailer, Best Buy has been dedicated to providing its customers with an unparalleled shopping experience for new technology, especially with the growing demand for UHD TVs. The new Samsung Entertainment Experience areas at Best Buy will highlight the stunning picture quality of Samsung’s latest line of TVs and feature the largest selection of award-winning Curved UHD TVs. 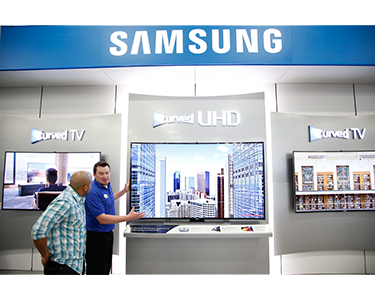 These dedicated areas in approximately 500 U.S. Best Buy locations were designed specifically for consumers to explore the superb details and brilliant colors found on Samsung UHD TVs. The new Samsung TV line will be showcased alongside the company’s home audio products, including the Samsung Shape Wireless Audio Multiroom System. The Samsung Entertainment Experience will be staffed by Samsung trained Best Buy retail associates who can answer questions and help guide consumers to the home entertainment solution that best suits their needs. Samsung introduced five new series of UHD TVs this spring, increasing the number of UHD TV models by more than six-fold from last year and offering a wide selection of both flat and curved designs to fit consumer preferences. With four times the resolution of Full HD, Samsung UHD TVs offer magnificent picture quality with both native and up-scaled UHD content. In addition, Samsung is working with the best in the industry to provide users with easy access to UHD content, including an exclusive UHD Video Pack with content from prominent Hollywood movie studios. Samsung’s Curved UHD TVs are future-ready, thanks to support of the Samsung UHD Evolution Kit, which allows users to stay up to date on the latest UHD standards and access to Samsung’s latest technologies. Headquartered in Ridgefield Park, NJ, Samsung Electronics America, Inc. (SEA), is a recognized innovation leader in consumer electronics design and technology. A wholly owned subsidiary of Samsung Electronics Co., Ltd., SEA delivers a broad range of digital consumer electronics, IT and home appliance products. Samsung is the market leader for HDTVs in the U.S and America’s fastest growing home appliance brand. To discover more, please visit www.samsung.com. Samsung Electronics Co., Ltd. is a global leader in technology, opening new possibilities for people everywhere. Through relentless innovation and discovery, we are transforming the worlds of TVs, smartphones, tablets, PCs, cameras, home appliances, printers, LTE systems, medical devices, semiconductors and LED solutions. We employ 286,000 people across 80 countries with annual sales of US $216.7 billion.